Bid goodbye to blemishes on wooden surfaces indoors and out with our picks for the best wood fillers on the market. Cracks, divots, holes, or rot can crop up on wooden surfaces due to ordinary wear-and-tear, accidents, and during do-it-yourself projects. Fortunately, wood fillers—which come in water- and solvent-based formulas—can be enlisted for all sorts of repairs, from hiding blemishes in the wood grain of cabinets and filling seams or gaps in door trim to sealing finishing nail holes in a newly built patio table. With a wide variety of wood fillers available—each having a unique formulation, usage scenario, and application technique—it can be tricky to pinpoint the right one to use. This guide will help you understand these practical putties and choose the best wood filler for your needs. Wood fillers are either water- or solvent-based. Either can be used to fill wood voids and/or pores, but they have a number of differences. Water-based wood fillers are generally comprised of cellulose, wood fiber, or gypsum. They tend to have a less potent odor, as they emit few, if any, volatile organic compounds (VOCs). Some water-based wood fillers are considered more versatile than their solvent-based counterparts because they can be readily diluted with water and used in projects requiring thinner filler. Water-based fillers typically dry in about 15 minutes, and the cleanup after use requires only soap and water. Water based fillers cost between $0.40 and $1.50 per ounce. Solvent-based fillers tend to be made of vinyl or epoxy. They have a higher VOC content—and are correspondingly smellier. Solvent-based wood thinners take about an hour to dry and cleaning up after use calls for acetone or turpentine. Cost-wise, solvent-based fillers range from $0.50 and $3.80 per ounce—pricier than water-based because they’re more resistant to water, humidity, extreme heat and cold, and rot, and so best suited for exterior wood projects and applications. Consider the following while shopping for wood filler at your local home center. Task: Wood fillers are typically formulated for one or more tasks that are usually indicated on the packaging. Some are suitable for filling voids such as divots, holes, or gouges in all wood species. Others are formulated to fill pores in open-grain woods with large pores visible to the naked eye, such as oak or elm, to smooth their naturally coarse texture. (As the filler inundates the pores, it levels any unevenness to achieve a finish particularly desirable on furniture.) The most versatile fillers can be used to fill either voids or pores. Consistency: Wood fillers can have thick (putty-like) or thin (pancake batter-like) consistencies. Thicker fillers are primarily used to fill voids, while thinner fillers are mainly used to fill pores in open-grain woods. It’s important to choose the right consistency for your project, as thicker fillers contain large particles that don’t readily fit into the pores of open-grain woods, and thinner fillers generally lack the body to adequately fill voids. (Tip: In a pinch, some thicker fillers can be thinned with water to fill pores.) If the wood filler packaging doesn’t indicate its consistency, check the task mentioned on the label for a clue: “for filling holes” implies thicker consistency and “for filling pores” means a thinner product. Color: The most common fillers come in white or wood-inspired shades; clear versions for filling pores are also available. 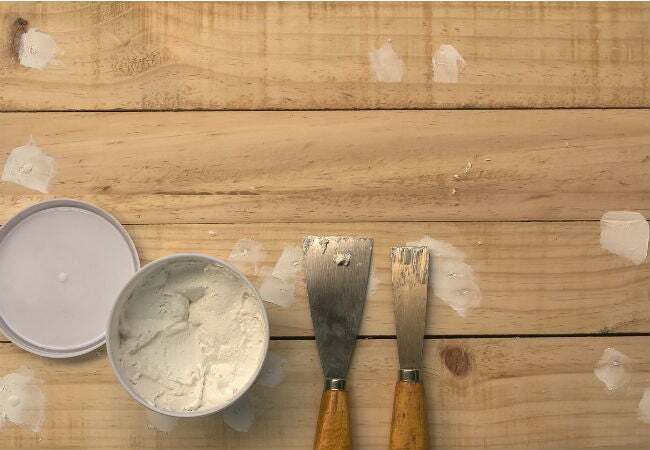 If you don’t plan to ultimately stain or paint the piece, opt for a filler in a shade that either closely matches or contrasts with the original wood color, depending on whether you want to play down or play up the filler color. If you do intend to coat the cured filler with stain or paint, first be sure to pick a product that clearly specifies “stainable” and/or “paintable” on the package, then choose either a white or a colored filler in a shade lighter than the stain or paint you’ll use. Application environment: Fillers are generally labeled for “interior-only” or “interior/exterior” use as an indication of how well the filler will hold up in the stated environment both during application, while wet, and post-application after it has dried. You can safely apply interior-only fillers indoors to wooden pieces that will stay indoors—e.g., a coffee table. Apply that same product outdoors and/or to a piece that will live outdoors, such as a patio table, and the filler will be more likely to freeze or harden while wet from exposure to extreme cold or heat, or crack or shrink over time once dry. You can safely apply interior/exterior fillers in either environment and to wood pieces that will live indoors or out since they can withstand extreme weather without hardening during application or cracking/shrinking once dry. Water-based interior/exterior fillers are more versatile because they’re durable enough for outdoor projects, yet emit virtually no odor while wet. While solvent-based interior/exterior fillers are safe to apply in both environments, you’re better off using them for heavy-duty outdoor projects (e.g., filling gouges or replacing rotted decking), where their highly weather-resistant solvents can handily defend against the elements and the fumes they emit while wet will quickly dissipate in the air. Packaging: Wood fillers are packaged in tubs, squeeze tubes, and sticks. Those in tubs are either no-mix and can be applied directly with a putty knife or spreader, or two-part fillers must be mixed before application. For tube fillers, you need only squeeze out a scant amount to fill voids or pores, while with stick fillers, you simply rip off a small chunk and apply by hand. Tubs, which hold the most product, tend to be most economical and so suited to larger projects while sticks are the least cost-effective and best used to repair scratches and cracks. Once you’ve weighed your options listed above to develop an idea of your perfect putty, start your shopping trip by checking out our picks for the best wood filler. Each of the following comes tested and approved by consumers just like yourself. 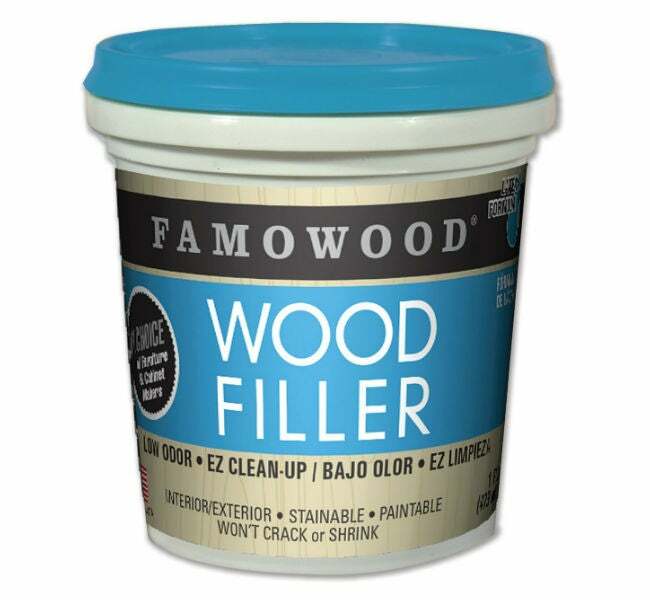 If you only keep one wood filler on hand, make it this 16-ounce tub of indoor-outdoor product that has the versatility and viscosity to handle voids of all sizes as well as pores in open-grain wood. Like other no-mix wood fillers, it can be applied straight from the tub with a putty knife, but it stands above the competition in its no-crack, no-shrink water-based formulation. Earning 4.3 out 5 stars from Amazon reviewers, it’s made of latex and real wood fiber, and cures in 15 minutes to a harder-than-wood surface that can be sanded, planed, and/or sawed. It can also be stained or painted—but with 10 colors to choose from, you may well find a shade that matches your project perfectly. Available on Amazon. 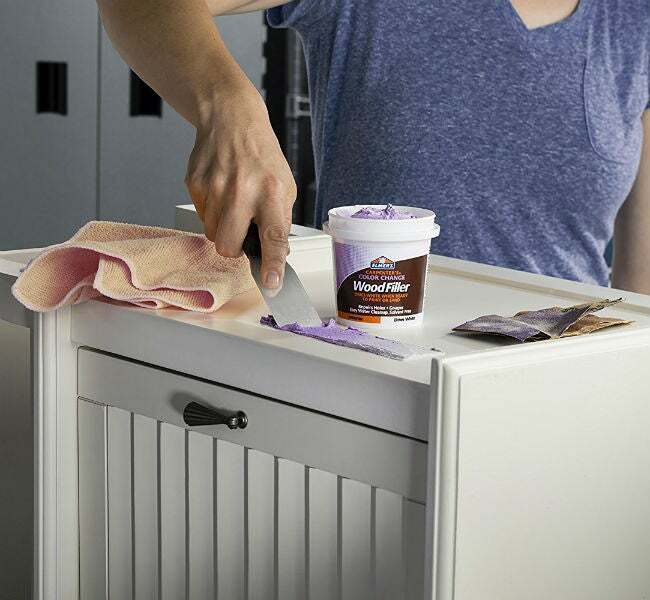 Perfect for the DIYer who hates wondering if wood filler has fully cured, this interior-only, no-mix water-based product boasts a patented formula that goes on purple, then turns white when it’s dry and ready to be sanded and stained/painted. Small repaired areas go white in as little as 15 minutes without shrinking or cracking, while deeper voids dry in two to eight hours. And with a 16-ounce tub at your disposal, you can fill a host of voids, from holes in wallboard to dents in furniture, with this filler that scored 4.3 out 5 stars from Amazon reviewers. Available on Amazon. Don’t want to lug a pound of wood filler around for your next small-scale indoor or outdoor project? 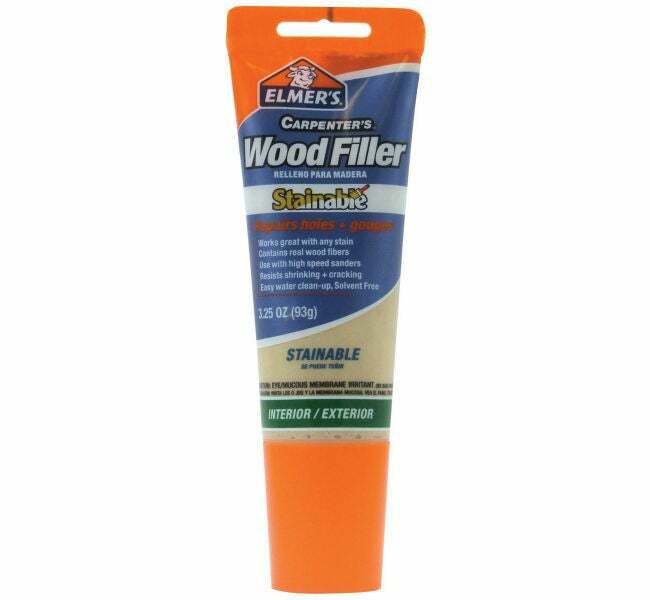 Rated 4.2 out of 5 stars by Amazon reviewers, this 3.25 ounce, 7-inch tube of water-based stainable wood filler conveniently fits anywhere. It’s the perfect crack- and shrink-proof putty for filling small voids, and its no-mix easy-squeeze application lets you comfortably reach and fill divots in interior wooden cabinets and carpenter bee holes in exterior soffits. Available on Amazon.